Save floor space by dedicating one wall to storage for all your office essentials. Mix boxes, trays, drawers and shelves in the same colour to create your own customised unit. Label files and boxes to keep everything organised and easy to find. 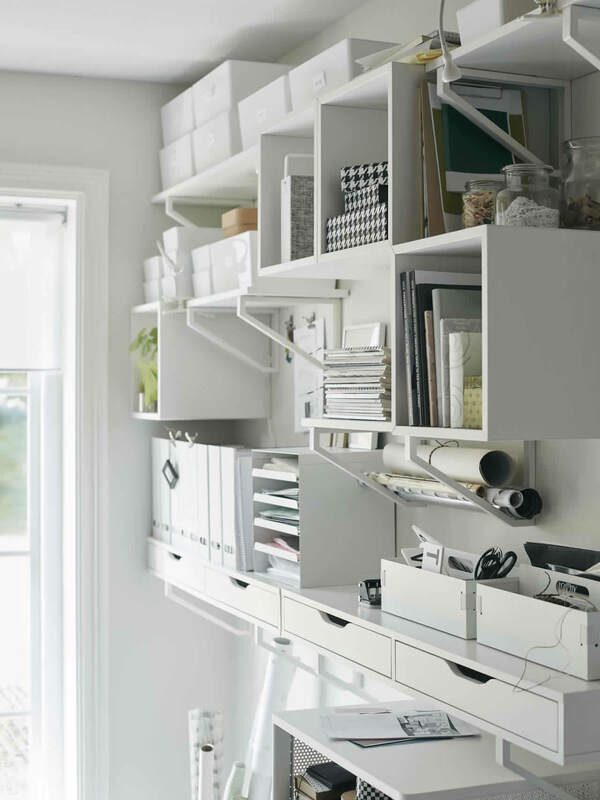 Try storing larger items such as paper rolls through the shelf brackets. A flexible workspace can be better for you and your productivity. Investing in a standing support such as the NILSERIK adjustable stool will make sitting more active and help improve posture. The stool’s height is easily altered to match the height of your desk just by pressing the buttons under the seat. Store space-saving foldable seating on wall-mounted hooks so it’s easy to grab an extra chair for colleagues when they come over. Use plants to bring a sense of wellbeing to your workspace and to blur the line between office and home. Move your office around your home to follow the natural light or take in an inspiring view. This storage unit on wheels can be used as a cabinet or as a standing desk. It has magnetic mesh sides where you can hook cables or post reminders.